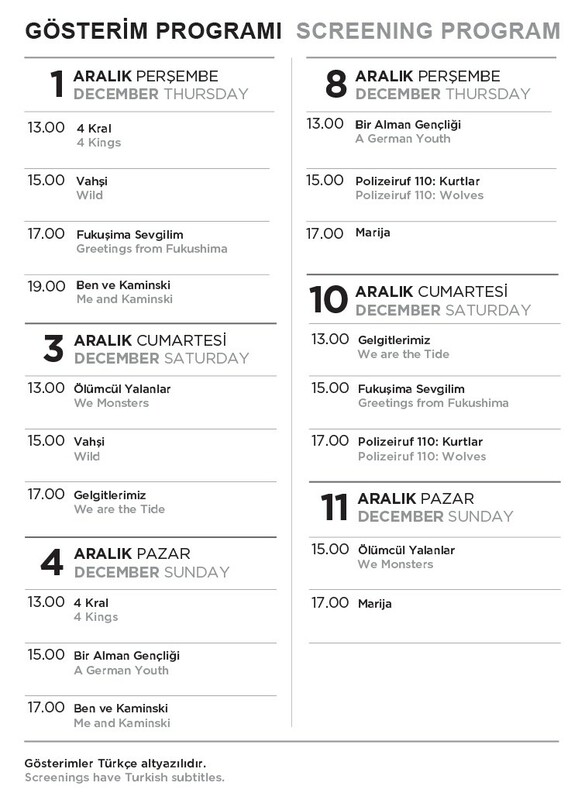 Presenting its eighth selection of Brand New Films from Germany, Istanbul Modern Cinema, in collaboration with the Goethe-Institut Istanbul continues to bring recent prominent German films to cinemagoers. Titled “Gray Zone”, this year’s selection presents films that wander between contrasting concepts such as light and dark, good and evil, pessimism and hope, and hostility and friendship. Some of the films that will be screened are; accomplished director Doris Dörrie’s new feature film “Fukushima, My Love” (Grüße aus Fukushima), Sebastian Ko’s suspense thriller “We Monsters” (Wir Monster) and Jean-Gabriel Périot’s “A German Youth” (Une Jeunesse Allemande) which was nominated for the Best Documentary Film category at this year’s César Awards. Marie and her husband separate on the day of their wedding. Marie decides to run far away so that she can leave her unhappy life behind. She goes to Japan to join a troupe of clowns called “Clowns4Help”. Her aim is to help those surviving the Fukushima disaster. Although she realizes she won’t be able to fulfil this duty before long, she doesn’t want to back down. She accompanies Satomi, an elderly Geisha, to her wrecked home in the region which has been quarantined due to radioactive contamination since 2011. An unlikely friendship develops between the women during their time together. Premiered at the Berlin International Film Festival of 2016, Fukushima, My Love is, for a long time, one of the rare German films to be shot in black and white, and widescreen format in such an accomplished manner. Paul and Christine are a divorced couple. Sarah, their teenage daughter, struggles to come to terms with their separation and is gradually becoming more difficult to communicate with. However, neither Paul nor Christine can predict the consequences of their daughter’s deep depression. Charlie, Sarah’s best friend, is missing, and both Sarah and her parents are resigned to the terrifying possibility all clues point to: Sarah becomes the cause of Charlie’s death during a fight fueled by jealousy. Although they find it difficult to believe it, Paul and Christine try to cover up the murder for the sake of their daughter and their future. This cold-blooded suspense thriller directed by Sebastian Ko turns middle-class moral values inside out and continually startles the audience with surprising developments. A glance at 1960s Federal Germany and the formation of the Red Army Faction (RAF). In the film, French director Périot refrains from any additional commentary and relies solely on archival materials. The audience discovers the director’s stance in relation to the subject in the montage of the film that features “underground” documents against film footage from the period. A German Youth incorporates segments from numerous television films as well as from the films of directors such as Hellmuth Costard, Ulrike Meinhof, Holger Meins, Helke Sander, Thomas Giefer, Helma Sanders-Brahms, Jean-Luc Godard, Michelangelo Antonioni and Rainer Werner Fassbinder. The film was nominated for the “Best Documentary Film” category at the César Awards. The protagonists of Christian Petzold’s new feature film, Police Call 110: Wolves, are Münchner police officer Hanns von Meuffels and his Hamburger colleague, heart-throb, Constanze Hermann. Constanze is undergoing treatment for her alcohol addiction in a health and wellbeing center in a Bavarian village. After a night of binge drinking she goes out and sees a wolf. Despite the fact that she thinks that what she saw is a hallucination induced by her excessive alcohol intake, the next morning the corpse of a young woman is found. The face of the corpse is ripped to pieces by a wild animal. Meuffels tries to solve the case with Constanze Hermann. Christian Petzold’s feature film has won recognition for its cracking acting, filming and soundtrack just like the two episodes he previously directed for the TV series of the same title. Marija immigrates to Dortmund in the Ruhr (Germany) from Ukraine. She wants to turn her long standing dream of opening a hair salon into reality. However, she first has to save money and she tries to do so by taking on small jobs and providing services for a fee. Meanwhile, her landlord finds her such jobs but over time starts to ask her for other things. Marija is not happy with the situation but how can she refuse a person who is offering to help her in a foreign country? The film was screened at the Locarno Film Festival as a competition entry in 2016 and later, at the Toronto Film Festival where it received appreciation. Fifteen years ago, the sea and all of the children disappeared from the shore of Wildholm, a small sea-side village. From that day on, grave silence prevails in the village with empty streets and neglected houses. All of the adults lose their hope and zest for life with the disappearance of the children. Jana and Micha, two young physicists, leave Berlin and visit the village to research this mysterious situation. The villagers treat them petulantly and no one wants to help them. Hanna, the last young person remaining in the village, is the only one who shows interest in their research. Together they try to lift up the curtain of fog that lingers on the event. We Are The Tide premiered in the Perspektive Deutches Kino category at this year’s Berlin International Film Festival. Although it’s Christmas, Lara, Alexandra, Timo and Fedja, a quartet of young people, are in a private psychiatric emergency unit due to unrest at home. Meanwhile, Dr Wolf, who is taking care of them, has no one to spend Christmas with. The therapy sessions that are challenging for all of them reveal that the experiences with their families is the underlying cause of their problems. 4 Kings is a striking coming-of-age story during which you will witness comical moments. Manuel Kaminski who entered the art world as Matisse’s student and Picasso’s friend at one time, became famous with the nickname, “blind painter” after losing his sight. One of the most interesting legends of the history of modern art, Kaminski has not shown his face in public for a long time. In fact, there are even those who presume he is long dead. Sebastian Zöllner, a self-ordained and opportunistic journalist, reaches Kaminski’s home in a secluded village in the Swiss Alps. In the end, Zöllner unexpectedly finds himself on a journey with the legendary painter. This film brings together director Wolfgang Becker and actor Daniel Brühl for the first time in 12 years after Good Bye, Lenin! The actor and director are accompanied by many famous European actors in both large and small roles.